There is no question that every musician who signs with a label has grandiose intentions. Not only do you want to spread your passion with millions around the world, but you also would be okay with making a few bucks and living comfortably on top of it. Sometimes those plans are derailed with tragedy and your desires suddenly become so insignificant. Back in the late 1980s, a group of guys formed a band in Tempe, Arizona. Lead by guitar front man and songwriter Doug Hopkins, they began playing local shows and generating a solid following. Shortly after forming, they brought on Robin Wilson to take over rhythm guitar, a move that would pay dividends as he’d eventually become the lead singer. They named themselves Gin Blossoms after a W.C. Fields reference in the infamously erroneous book Hollywood Babylon. Understanding they needed to grind, they toured feverishly around Arizona. They dropped an independent album in 1989 that sold a few handfuls of copies. Locals labeled them as having the “southwestern sound,” similar to other Arizona-based groups at the time such as The Meat Puppets. They caught a break in the early ‘90s when they were offered a deal with A&M Records. Initial attempts to create a commercial record failed, but they regrouped and stayed active in the studio. 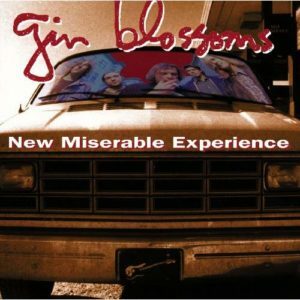 After a variety of difficult sessions, their debut album, titled New Miserable Experience was released in August of 1992. With the label having modest expectations (putting it lightly), they didn’t market the album much. As a consequence, sales and reviews were minimal upon release. Doug Hopkins was fired from the band shortly after recording was complete due to arguments with management and alcohol problems. Just when he thought the band was doomed and his termination was meaningless, the single “Hey Jealousy” hit national radio in June of 1993. The song was an unexpected smash hit and got up to #4 on the charts, catapulting the album to #30 on the Billboard 200. After that milestone, two other tracks hit mainstream radio and the album was being talked about all over the media. To date, the album has sold four million copies in the U.S. alone. Just as the Gin Blossoms were set to receive their first gold record from the label for all their success, Hopkins committed suicide due to mental health issues related to alcohol abuse. Obviously the group’s achievements were overshadowed by the loss and the band contemplated calling it quits. They decided to record and dedicate an album to Hopkins memory, which was released in 1996. After that, the band did break up for over half a decade. Reforming in 2002, they are still going strong today with an album coming out recently this past June. Their style is still similar—that modern pop that seems to transcend time. While the album at hand got a little country at the end, it’s still that power pop overtone that seems to love top-40 radio. Wilson’s vocal is certainly a signature of the band, and makes them very recognizable in the car or at the grocery store. This brand of pop was often criticized as being forgettable in an era with other legendary bands, but I think the Gin Blossoms carved out a decent niche for themselves. They may not be heading to the hall of fame anytime soon, but in terms of 90’s acts, they still draw a crowd over 25 years later. Gin Blossoms even did a 25th anniversary tour to celebrate the album last year. The label produced a 25th anniversary album in combination that featured demos and outtakes from the original. All in all, this is a solid memory of the early ‘90s and offers a look back at what a true pop band looked like then—and kudos to the band for persevering in the face of an incredible tragedy. Hey, I’m jealous of this price—at $5.99 this is a steal of a deal. Pick up New Miserable Experience up today and rock out to the Blossoms!